This is the second in our series of blogs on Cash Flow – by Michael O’Brien of Big Red Cloud. Leading on from Part one where you should have a clear understanding of the importance of cash flow, now we go to the next step and look at cash flow measurement. What we can measure, we can fix! Having the ability and know how to foresee your cash flow situation over the course of the coming months is something you should try and master. The better prepared you are, the less issues you will come across along the way. Cash flow is receipts coming into the business less cash paid out of the business. When one figure is taken from the other your business is either left in a positive or a negative cash flow situation. Your business has been able to monitor and manage its cash flow correctly and there is enough money coming into the business to cover any outgoings. Urgent action is needed to resolve the current cash flow situation as the business does not have enough money to cover the money that is leaving the business to pay for wages, purchases and expenses. One point that cannot but be over emphasised enough is cash flow forecasting for your business. It is a very important analysis when planning ahead for the future of your business. Top Tip: Forecasting will not only give you the foresight to manage your business accounts but more importantly your payments, so you can always keep on top of your cash flow. Forecasting can be vital for the future of your business. If it is carried out correctly it can put you and your business in a good position. Nasty surprises will become a thing of the past with accurate data now building the foundations of your business. An accounting software solution is something you should consider for your business especially to facilitate proper, accurate and timely forecasting. Provided below are a number of key practice recommendations that you should take note of when you are moving forward with your business. This should result, firstly in a solid foundation for your business and secondly a stable, positive cash flow position. The first key to good cash flow management is to simply be aware of the pitfalls ahead over the coming months with regards to payments. Mapping out when you see the need for large chunks of cash and being ready for those instances is half the battle. Obviously you cannot prepare for every such instance but having as much of the future mapped out in front of you as possible will help prepare for unforeseen cash flow challenges. Planning is a fundamental business skill, no matter what the subject. Top Tip: Taxes can often be neglected when taking the above issues into consideration. It’s not just the employees who need to be paid but also the tax man. Don’t forget! The quicker you invoice your customers the quicker you can get paid for the sales you make. If it takes you 2 days to invoice your customer’s details then this means that is going to be at least 3 days before you receive any payments. Top Tip: A sale isn’t a sale until it has been invoiced. Having all the necessary information such as PO numbers is another important point to quicken up the process. Anything that can help you speed up the payment process should be looked into and carried out. One key to carrying out forecasting is to be able to identify the largest payments being made by the business. By identifying these payments your business should now look at these figures and see how they could be reduced through cut backs or even bulk buying. One of the most important points especially when it comes to cash flow management has to be credit control. Only giving credit to customers who can actually pay their bills on time is a huge step towards getting payments in on time. Credit limits have to be put on customers who have a negative payment history with the company. Top Tip: Companies should outline their credit policies to customers to make sure everyone is on the same page. Receiving cash up front will allow you to pay necessary suppliers to set the project underway. Finally always chase up on invoices. Regular reminders will go a long way in getting your payments in on time. Monitoring your payment terms and updating them when required is a good routine to get into as a business. Shortening payment periods in times of need and expanding on payment periods when everything is under check offers the customer a bit of leeway. When it is your turn to make a payment it is better to wait until the bill is actually due rather than making a payment beforehand. Focusing on your cash flow situation is a lot more important than paying your own bills beforehand. A point that can easily go unnoticed by a business is money relating to taxes such as VAT. Tax is money collected on behalf of the government that the business is obliged to collect and pay. Top Tip: A good idea would be to open a second bank account that deals specifically with tax. It will make it a lot easier for your business to see what cash is actually yours or the governments giving you a far greater idea of your overall financial situation. Penalties and interest charges should be avoided at all costs and this is one useful way of combating this issue. Wages are always one of the biggest expenditures within a business. Therefore it is very important to get this part of the business all above board. Top Tip: Investing in a simple payroll system will save you a lot of time in the long run. Building up a solid trusting relationship between you and your bank manager could be very beneficial in the long run for your business. Getting help with loan repayments, overdrafts or a short team moratorium on existing loan repayments (if it is particularly a bad time for you) are just some of the benefits a bank manager could provide. Top Tip: Keeping your bank up to date with your overall position and future prospects is a great way of building a trusted relationship with your bank manager. 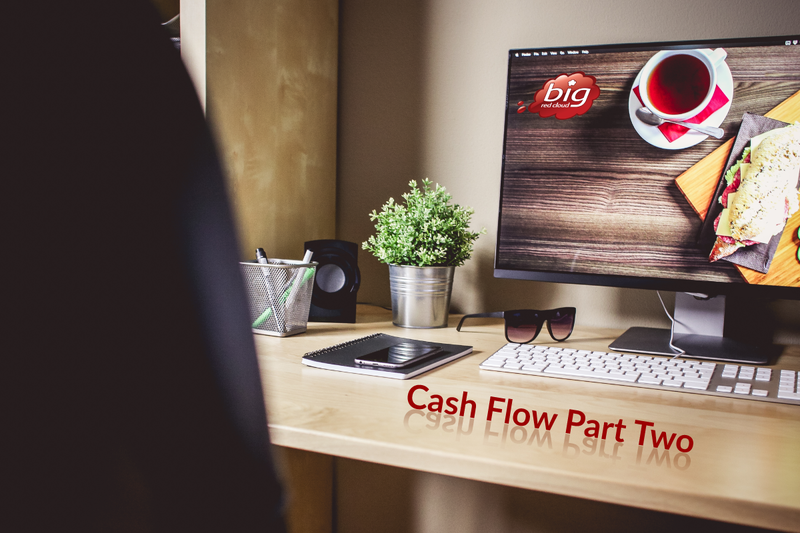 We look forward to seeing you in for Cash Flow Part 3, our final post in the cash flow series where we will look at three additional benefits of good cash flow management. Also, we’ll share with you a really handy cash flow checklist that you can use in your business.